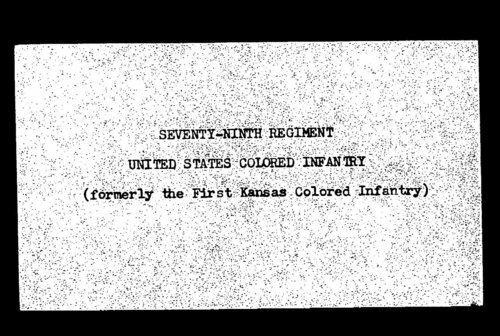 This is the roster for Civil War soldiers in the Seventy-Ninth Regiment, United States Colored Infantry, formerly the First Kansas Colored Infantry. An index is at the beginning, giving the name of the soldier, his company, and the page number his record is listed on. The lists may include name, age, place of residence,rank, and enlistment date. For many of the soldiers the roster includes the date they left the service, the place, and the reason. The index to the Kansas Adjutant General's Report, 1861-1865, (see link below) also gives the regiment and company the soldier served in.